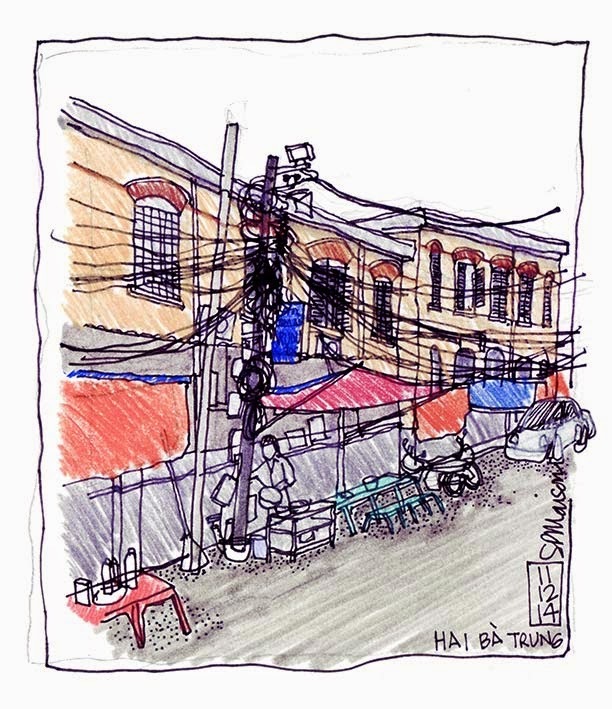 I needed to have breakfast at 7.00am to get the flight back to Singapore, but I was determined to get in a quick doodle on this third, and probably last trip to Hanoi. As the sun threw some light over the Opera House area, I wandered down one of the side roads to watch the women setting up their street-side cafés. There was much amusement as I took a few photos of the ladies hacking away at lumps of meat, vegetables and herbs while others stirred bubbling pots of steaming liquid. With only a quarter of an hour left, I whipped out my pens and started to scribble what was to become a rather disappointing sketch. I shall miss Hanoi.